In a frighteningly realistic near future, Cal and Frida leave behind a crumbling Los Angeles in search of a secure community to raise a child and must quickly decide whom they can trust. Lepucki’s main characters, the 20-­somethings Frida Ellis and Calvin Friedman, live in a near-future in which the most privileged have withdrawn to communities (called Communities) defended by private security forces. The less fortunate — those of them who haven’t died from the flu, anyway — eke out an existence in failing cities … Because the wilderness doesn’t hold much threat, the book derives most of its tension from the friction that exists between Frida and Cal when they’re not blissful in bed. Sometimes it’s difficult to understand why they’re arguing, though, and other times it’s equally difficult to understand why they’re not … The last chapter of California, with its emphasis on security over freedom, supports a reading in which Frida and Cal never had a chance, still unable to make the connection between the ills of a runaway consumer society and environmental devastation. Lepucki focuses on the complexities of basic human emotions, testing allegiances and letting secrets unravel even the most steadfast of survivors, all while illustrating how impossible it is to change what inherently makes us human … Woven into the plot are Frida and Cal's memories of their previous lives and their now-lost family, including Frida's younger brother, Micah, who brought the couple together years before at an all-boys university named Plank … Murky events, a blurry past and a questionable chronology mar Lepucki's entry into the literary post-apocalypse genre. Clear-cut rules of the world are critical and having an unsteady authorial hand leads to a shaky foundation...Lepucki's cautious dystopia never quite asks the right questions of us, ultimately to the detriment of the novel. Frida isn’t much of a heroine. She’s annoying, self-centered and tragically naive. 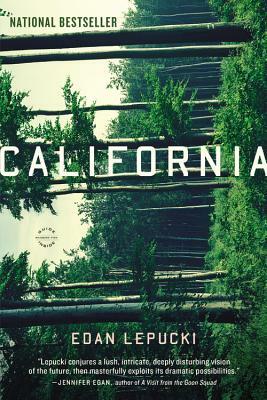 She and her husband, Cal, have fled the ruins of Los Angeles in the wake of earthquakes and financial collapse … Lepucki has armed her novel with a stunning twist, and its fallout is thrilling. Beyond that, the book’s critique of our culture’s ridiculous back-to-the-land fantasies is amusing. Yet some of her choices are less convincing … Still, Frida’s self-absorption has its uses: For one, it allows Lepucki to detail the minutiae of survivalist life. Until they join the Spike People, who have access to a surprising range of consumer goods, getting clean is impossible, and fungi are free to flourish. ‘Even her knees had smelled.’ Selfishness also means self-preservation, which is a kinder interpretation of Frida’s immaturity. What did you think of California?